I've noticed that more experienced bloggers refer to updating. "It's weird how not updating is self-perpetuating," Miss Beth Ann writes after a long period of silence in what turns out to be her last post of that particular blog (she's since moved from LiveJournal to the trendier MySpace: "and when I became a [law student], I put away childish things" as it were). Updating. So perhaps you'd like to know how some of these stories turned out. You'd like an update. I know I'm bemused by the outcome of seemingly minor events in everyday life. Of course, some things are part of life's ballast: they won't change without a good reason. My briefcase is still large, lumpy, and full of greasy mixed nuts and loose change. Any event more formal than a roof-tarring reveals serious gaps in my wardrobe. The ultimate purpose of small appliances remains shrouded in mystery. 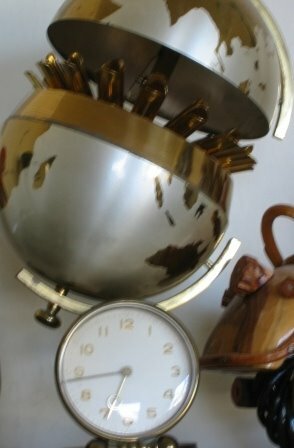 My Five Year Clock is still ticking away the minutes, moved from beside my laptop to the mantle, along with Aunt Yetta's cool filterless cigarette dispenser. Harvey, my living room ficus, is still dropping ficus berries on the floor in the middle of the night (last night, there were hundreds; they woke me up. Plop. Roll. Plop. Plop. Roll). And I'm still running somewhere between 1 hour and 3 days late. But lots of other minor bits could benefit from an update. The Mr. Coffee surrogate, for example, has turned out to have a major design flaw. It's not surprising: $15 small appliances are seldom built to last. I was originally intrigued by the off-brand's sleek lines and unusual styling. Well, it turns out that there's a reason that Mr. Coffee's design is so widely imitated: there are things that can go wrong if your coffee maker is designed in a more imaginative way. 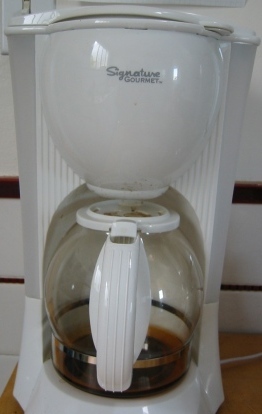 As is the case for Mr. Signature Gourmet, my off-brand Mr. Coffee. The hot water is routed through the thing's lid and I guess the lid gets mighty darned warm. Warm enough to warp plastic. The top won't close properly; there's already a quarter inch gap. It won't be long until it transmogrifies itself into a combination letter steamer and aromatherapy unit. In fact, if I extrapolate (which I'm prone to do), I can calculate that at this rate, it'll be fully open in less than a year. The lesson here is to never trust Walgreen's for your small appliance needs. Yeah, they're okay for Wal-AWAKE and Wal-tussin and Wal-mucil and Wal-atin and Wal-rus, but they don't know squat about small appliances. So don't you be going to Walgreen's to buy salad shooters or coffee grinders. But, on the bright side re: Mr. Signature Gourmet, we haven't managed to leave it on unattended for long periods of time. So that worry stemming from the absence of a clock -- forget about it! No fires. No singed and scorched spots on the ceiling. It's not a problem. Yet. It really does appear that it'll break before it sets the house ablaze. Phew. The notorious Park Central Hotel in Midtown Manhattan has earned a spot on my "dead to me now" list by sticking me with a mysterious $44.31 charge. It's got to be room service again, for yet another meal I didn't eat, possibly the one where I went across the street (in the rain, yet) to Fluffy's Deli (what a peculiar name for a deli! ), or maybe the one that I sorted out by buying yogurt and 25-cent bananas at a nearby convenience store that offered a poisonous-looking salad bar as an alternative to a very minor selection of groceries. As Stephen Colbert would say, "Park Central Hotel, you are dead to me now!" The awful thing about it is that contesting a charge on my corporate Amex looks to be about as difficult as creating an SEC filing. Ominous warnings filled my screen when I began to initiate the process yesterday. So, coward that I am, I temporarily hit the back button. There are times when I'm grateful for the statelessness of the Web. No. Maybe I don't want to protest the charge. It'll cost both my employer and me more in time and effort than just sucking it up and pretending I actually *did* eat some $44 room service item. But that doesn't suit my desire for revenge. And I'd like to at least know what meal I didn't enjoy -- was it a basket of stale breakfast breads or a soggy club sandwich? Did it come with a cool miniature bottle of catsup (a much better condiment packaging technology than the packet)? For $44.31, I hope I at least didn't get to eat a club sandwich with fries and a dill pickle spear. I suspect I'll never know. And I suspect I have more sense than to contest the charge. Or do I? I'm oddly angry on behalf of my employer. Plop. There goes another ficus berry, courtesy of Harvey. I wish I could report that I have fewer houseplants, not more, but I'm trying to root a Dracaena that had gone bad. So now I have the potential of 5 more houseplants. Plus the original plant, which has been relegated to the light well to either thrive or not. At least the Bromeliad (Mr. B) and the Alocacia (Alfie) are both in bloom and one of the cacti has shown a brave tendency toward phototropism (evidence that it's really a live plant, which it'd be hard to know given that cacti are usually slow-growers). My advice here: don't name your houseplants. Really. Don't. It's almost worse than Wilbur and the inability to eat bacon. I know I haven't mentioned this before, so I guess it doesn't really fall under the rubric of updating, but I'm puzzled and vaguely disturbed by a billboard that I see regularly on my way to the airport or to my double-super-secret Silicon Valley office. It's a Delta ad, right by the SFO offramp. What it says is: "Enjoy Buda, Fly to Pest." I realize that Buda's on one side of the river and Pest is on the other, but it's a perverse ad nonetheless, one that's slightly Pynchonian, like having a big post horn to distract you as you're trying your best not to be pancaked between an Escalade and a Mercedes SUV. The billboard may also have an unusual color scheme; I can't use a camera while I'm driving (unlike many of the other people who zip down 101, PDA in one hand, Starbucks in the other, and a headset on so they can talk on the phone, hands-free). So I don't have a photo. But I see it's been a topic for other bloggers, so I'm not the only one who's found it, well, disturbing.